This is a story about a college girl that has to work during her college year and finally decided to become a work at home student at Travpart. She is Lita. She was born from a rich family, but a piece of bad news just hit her. Her family’s company nearly came to bankrupt. Her parents decided to tell her that they needed to save money for living while trying to put the company’s back on its feet. She knew at that time she needed to did something with her college. She did not want to make her parents felt too heavy with her tuition. Since she was born from a rich family, it was fairly enough to say that she never had a job. This was her first experience to actually had a job. She applied to become a cashier in a coffee shop. She got accepted, and she worked from 5 p.m. to 11 p.m. after a while she decided to resign from the coffee shop. She did not feel comfortable because the boss was too rough for her. She often replaces her friends because the boss told her to did that yet she did not get the paid that she had to get. And there was one day when the boss decided to rant on her because the coffee shop was running out of money and the boss decided to point a finger on Lita because she was the cashier. At the end of the day, the money was already inside the coffee shop bank account, but the boss forgot about it. After the resignation, Lita tried to found another job, but it did not go as what she planned. She got rejected because of her lack of experiences. Once, she decided to work in a bakery because she loved to bake a cake, but unfortunately, the bakery did not let her to showed her creativity. So she could only follow the rule and bake a basic cake. Once again, she decided to resign. One day, she told her friend about what she has been through, and her friends suggest her to become a work at home student as an Online Travel Agent at Travpart. Her friend recognized her talent at writing and traveling, so she suggests Lita apply as an Online Travel Agent and promote his packages by creating engaging content in her blog. She never knew how Online Travel Agent works but she decided to took a chance. The working hour is so flexible so she could still study and did other activities. She can write about interesting attractions while selling her tour packages in her articles. Moreover, she got an income that she thought was suitable for her work. The result? She could help her parents to pay her tuition by pay the half of it. She could buy something that she needed that related to college with her own money. She also saves some of it. Lita already proved it as a work at home student becoming an Online Travel Agent at Travpart. Even a college student can get a stable income from Travpart. So, what are you waiting for? 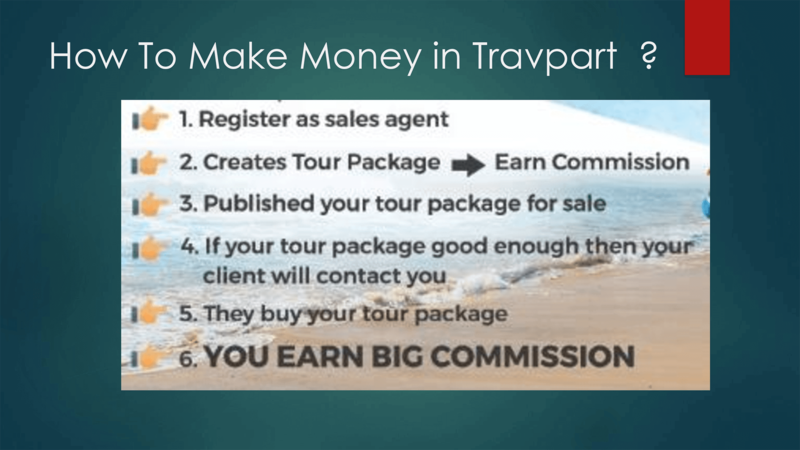 Join Travpart Travel Agent and prove it by yourself! Eko: Online Travel Agent at Travpart With Lack of Disabilities. This is a story of a Father that has to quit from his job as a driver because he lost his leg and become an online travel agent at Travpart. Two years ago, Eko lost his right leg due to a car accident. The doctor chooses to amputate his leg so he could go on with his life. But it didn’t stop there. Because of that accident, Eko became paralyzed. Eko didn’t have any choice but to resign from his current job as a driver. For a year and a half he spent his time to learn to walk again, he learns how to use crutches. He had to learn to move his own body. He needs to learn to spoke. Basically, he needs to learn everything from the beginning again. About a year and a half his family had to do anything to got money. His wife started to open a food catering service, his 17 years old son had to sell snacks, cookies, even a meal in his school and his ten years old daughter had to help his wife. In his free time, his family will always help him practiced everything from the beginning. Eko showed some progress, and he could walk by himself now. He could talk even sometimes the pronunciation or the meaning of what he said is not quite clear. He started to move his body and tried to help his wife’s food catering service. People may think that their life is really good now, but actually, it was not. Eko started to think that they could not make the food catering as the family’s main income. He started to think that he needed to found a job, but he was so pessimist. He was not sure what kind of job he should apply. He was always thinking that no one will want to accept him as a worker with his current condition even if he was getting better now. He was so desperate, as a family leader, he needs to do something to change his family condition and situation. One day he saw an advertisement from the internet about Online Travel Agent at Travpat, he started to think to give a shot on that space. With his condition he did not need to be a driver; he could apply in another position. When he still thinking about the pro’s and con’s of this job, he realized that his previous job as a driver was actually helped him to applied. When he worked as a driver, he needed to know every destination before he went there. So this job suitable for him because he already knew a lot of places that could support him in this industry. So, people could visit a new place and felt a new adventure. He started to access Travpart website and learn about it. After a few moments, he started to apply from the platform only in a glimpse, and he could make a package that he could sell in the platform at once. As an online travel agent at Travpart, he realized that he could manage everything from home. He has several exciting tour packages in the platform, and guess what, only less in two weeks, one of his packages sold. It was the first time he could making money online as an online travel agent at Travpart. It was an amazing moment for him, and of course, for his family. Well, Eko and his family’s life has changed. Eko got a stable income and a job that could accept his lack of physical ability. His wife’s catering continued until this day, and his kids were still helping their parents. Remember, your lack of ability is not a barricade for you to stop doing something you want and like. Join as an Online Travel Agent at Travpart and change your life just like Eko. Life Changing Moment as Travpart’s Online Travel Agent. Nobody knows what will happens tomorrow or today. That’s the exact sentences for Mira’s situation. Mira is a single mother that has to raise two children all by herself. Divorced with her husband five years ago, and since then her life is always rough. She doesn’t have a job. She has to get out from her job when she knew she was pregnant, her ex-husband always wanted Mira to stay at home but Mira decline. The first time they knew Mira’s pregnancy, the ex-husband forces her to get out from her job to take care of their child. Finally, Mira gets out of her job. But life always has it’s up’s and downs. The first down situation started when they decided to divorce. Since then the only custody that she get was for their child, not for hers. The second down situation is when she realized she doesn’t have a job and she needs to get a job because if she only waits for the custody, they won’t stay alive. Mira starts to do every job that she can. She washes someone’s clothes, cleans their house, cooks for them, more like a maid. But another problem comes when she can’t look at their child as often as before she works. She tries to find a job that can let her see and take care of her child while also do her work. Her friend suggests her works in a nursery home, and she tried it. Another problem comes when she works in a nursery home. She got fired because she brings her kids and instead of taking care of the people in that nursery home she takes care of her own child. We can say that even if we don’t trust magic, sometimes magical things happen. On Sunday morning she was scrolling through Instagram when some of her friends advertised a travel agency. It called Travpart’s Online Travel Agent. She contacts her friend and tries to ask how does Travpart’s Online Travel Agent work? Her friend explains briefly to her, and she feels that this job is suitable for her. She can take care of her child while also do the job since it can be done online. She starts to join Travpart’s Online Travel Agent. Since then, her life is changing drastically. She has a stable income, and she can take care of her children. Her life was saved when she starts to work in Travpart Travel Agent. She also has a lot of connection because she met a lot of people. Her life is now full of happiness between her and her child. Travpart Travel Agent does play a big part in changing her life and help her to get back to her feet. So if you are still thinking about joining Travpart’s Online Travel Agent, you have to be sure and make the decision now, because Mira starts with that. She believes and make the decision and now her life change for forever. Join Travpart’s Online Travel Agent and be a part of the change! Joining Travpart Travel Agent, Life Is Changing! Travpart Travel Agent Story – This is the incredible story of Ari with Travpart. Ari is a man that was still looking for a job. He used to have a job, but he didn’t feel comfortable with the job. He has trouble in his previous job. His boss always expects him to just stay inside his office while he can’t do that because he can’t stay quiet in one place for a long time. But if he can’t stay quiet in one place for a long time, why he choose the office job? Well, simple. He needs money to live. Recently, his parents are no longer capable of going to work and since he is the oldest so it is his time to be the one that should take care of the family. He spends his free time by exploring a lot of places, building a connection with a lot of new people and try to find the beauty of every place because every place is different and unique. He realized since a long time ago that he likes to explore the world, so office job is not suitable for him. He prefers to move from one place to another place. Until one day some decision change his love for forever. One of his friends introduces him to a travel agent called Travpart. Travpart is a travel agent that based on online that you can easily visit the website at www.travpart.com, easy right? 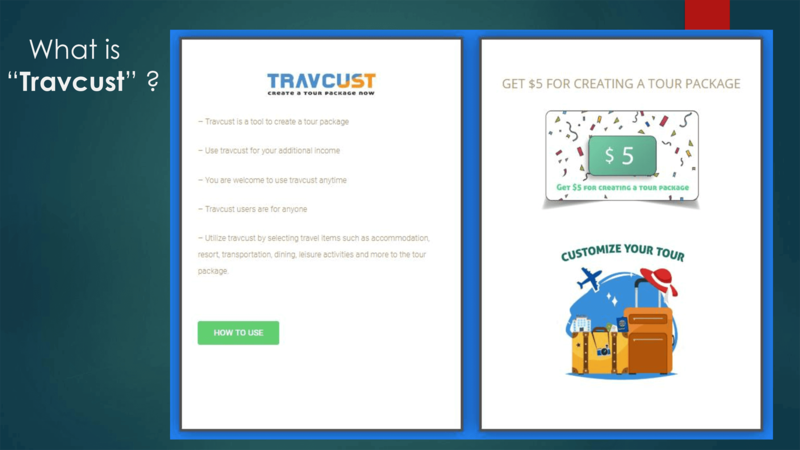 Travpart let you have a travel business deal that will give you a lot of profit. At first, Ari is still not sure about taking the job as a travel agent, but his friend convinces him to take it because not everyone gets a chance to have a job that also the same as their hobby. Ari realized that a big opportunity like this is not always come twice in his life. He realized that this is the only chance to have a job that he also desires as his hobby, so it will be like doing his hobby. He decided to take the job and be a travel agent. Travpart gives a lot of profit that it will let us make our own tour package as what we desire. So we can follow their package or get creative and make our own package. A few months after working in Travpart, Ari is enjoying his life more than ever. His income is always stable, sometimes higher. He is happy with his job because Travpart is not only a travel agent but also a place for people to be creative, connected to other people, exploring even the hardest road to arrive at the destination. Now, if you are thinking to be a travel agent like Ari, what are you waiting for? Join Travpart Travel Agent, and do your job like you are playing with your hobbies! Erase your mind that a travel agent is not a high-quality job. A travel agent is a quality job and a lot of people already prove it by joining Travpart Travel Agent included Ari. Everyone wants to know how to make a lot of money, to fill up their wallet and boost their income that they currently can obtain. In this digital era, there are a lot of options on how to make more money. But the risk that comes with it is also included with these choices. 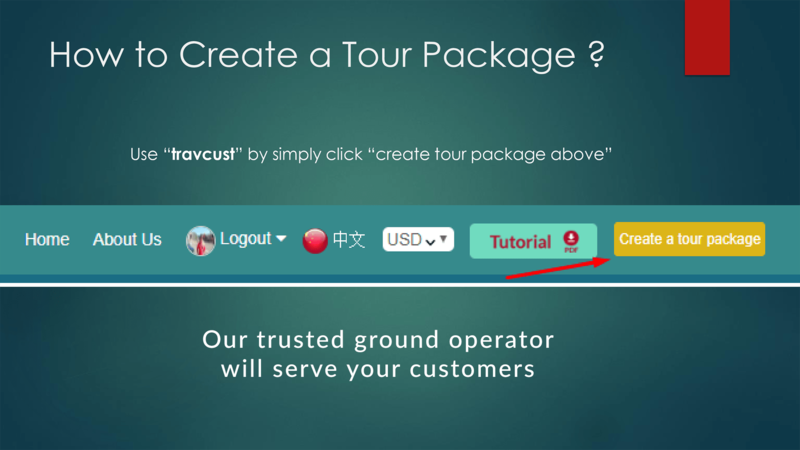 However, there is one that you can do with low-risk but a high-reward option that you may choose to contribute: making Tour Packages! Tour Packages are travel packages that are laid out to several accommodations, routes, leisure facilities and many more wrapped up into one purchase. You can purchase an already published itinerary or a custom-made one for your tour packages by publishing it to the affiliated company; they would look into it and see what they can do. Getting into a custom-made itinerary is very simple and easy to set up. A feature in Travpart.com gives several options to choose from to get your dream vacation. 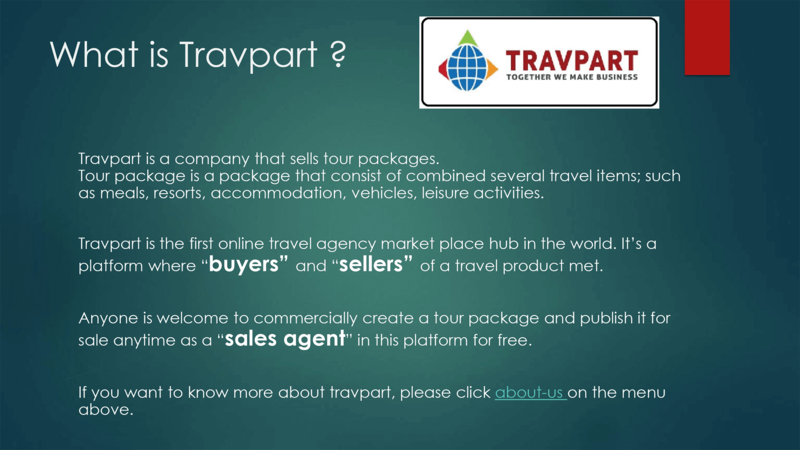 It’s entertaining and engaging creating a travel package from Travpart platform. There are two options on getting your itinerary; you can browse through their already made Published Tour Packages that are currently on sale OR go to “Custom” and create your own tour package. 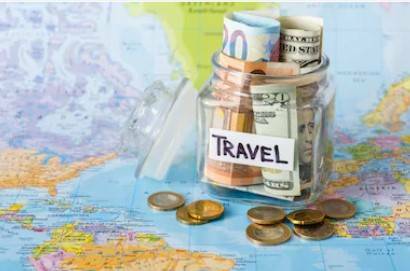 In the Published Tour Packages, type down your desired Destination, Agent’s name you might know, how many days you would be traveling and what Budget are you on or looking for that suits your wallet. From there, the site will search for the best option that you can also negotiate. 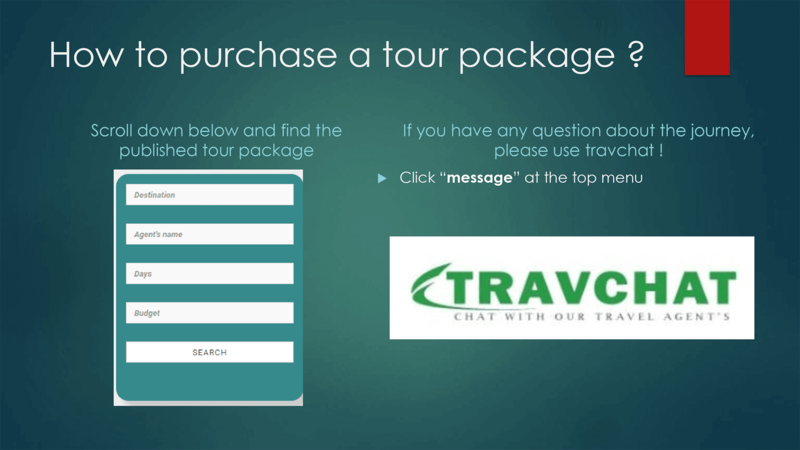 Here is another way for the travel agency to get a lot more money; custom made tour package. First of all, type down the routes that you want to go from and to. Secondly, specify the date you are planning to travel and how many days you want to travel. Third, tick several destinations available from all over Indonesia that you want to go to, or you can tick “Other” and type down the specific destination that you seek. And then, type down the number of rooms of the accommodation that you want to get, how many adults and children in the trip, what language that you speak to help you ease communication, what your budget that you are willing to put into the trip, phone number and email address to get in touch with the agent. Finally, specify what activates that you want to do and what to see on this travel, set a meeting point on the destination and perhaps any other additional description to note down. After you have filled in the custom made plans, you can check out their price lists provided to get the most out of the itinerary that you’ve created. They will ask for other information such as lunch and dinner inclusion, hotel star level, how many people, who will be your tour guide and driver, arrival and departure. You can also go to their table down below and fill in example numbers of the number of different facilities and accommodation counts to calculate how much you will be spending. With all these available options, you can pinpoint on how many, how much, what time and where you do want to head over to their agency, and they’ll be sure to accommodate and facilitate you with anything. However, the custom-made itinerary will take time to make, this how they can make more money for the best experience of your vacation and allocate them to the best there is available to you as you travel with their service. Best of both parties! 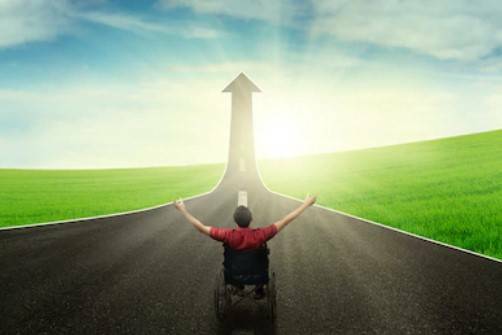 Everything is more accessible with Travpart’s feature on their website. You can get your dream vacation in no time with this ease of planning the trip. Moreover, you’ll know how to get a lot of money. So if you are unsure what to turn to for planning your journey to the dreamland of relaxation and leisure, visit Travpart.com today!